Let’s put a warning label on false prophets | Open Our Eyes, Lord! (1) I want us to identify all preachers who have mistakenly announced that it was the end of the world because of some newspaper headline. (2) I want their unfulfilled predictions to be logged in some sort of database so that any interested party might access it. In addition, and this is the gist of my plan, (3) I want these prophets to have to wear some visible sign, so that other believers will know to take heed of any future theories. I was flipping through Hawthorne’s The Scarlet Letter yesterday to look up an odd fact, and my grand idea came to me: anyone who has made a prediction of the end times which has not come true must be required to wear a red letter to mark them as a bogus prophet. I was going to pick out F for false, and then P for prophet. Then FP, but that wouldn’t make a single scarlet letter. The New Testament itself solved my dilemma and also will make the scarlet letter instantly recognizable. You see, the Greek word for false prophet in Matthew 24:11 is one word: pseudoprofetes. The first letter is PSI (Ψ), which has a PS sound. Here is a design, albeit rudimentary, of what unsuccessful prophets will be given to wear. 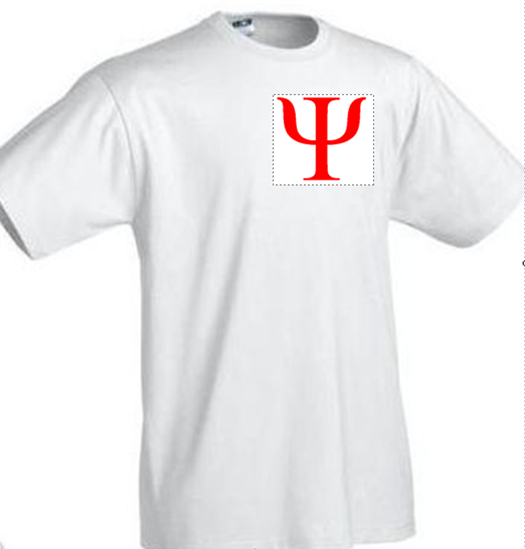 It is a sturdy cotton tee, sizes S-XXXL, washable. The logo will signify “I’ve been wrong in the past, and I probably will be in the future.” It’s guaranteed to not fade; I want these things to last until, well, until kingdom come. Is this being a little harsh, labeling as a false prophet a person who is simply trying to make a connection between Bible prophecy in our day? Not at all. After all Jesus said that this age would be filled with people who would make wrongheaded pronouncements, claiming to reveal truth which belongs to God alone. He called them false prophets, not simply fallible and mistaken people. The very first Christian book I read was the megahit, Hal Lindsey’s The Late Great Planet Earth in the early 70s. He predicted, among other things, that the world would end by the 1980s. He made a false prediction, and it makes no difference that Lindsey didn’t claim to possess the gift of prophecy. He’s been giving dates ever since. Neither did Harold Camping claim a prophetic gift, nor Jack Van Impe. John Hagee sort of does. What does it matter? If someone says “Lo! There is Christ!” (Matt 24:23) and Christ is not there, then he or she falls into the category of “false prophet” (see v. 24). On the other hand, Jim Bramlett does claim to be a prophet and that “no one knows the day or the hour” doesn’t apply today: people should keep predicting dates, since eventually “someone will nail it” (it’s the idea that a broken clock is right twice a day). They have all made and keep making false predictions and that’s enough to get them a T-shirt. Multiple T-shirts in fact; I may have to design jackets and caps as well. Tote bags, anyone? Forty-five years after Late Great Planet Earth and it’s gotten tiresome. There’s Harold Camping, of course, with his mystical logorithm tables (click HERE), but mainstream people play the same game. 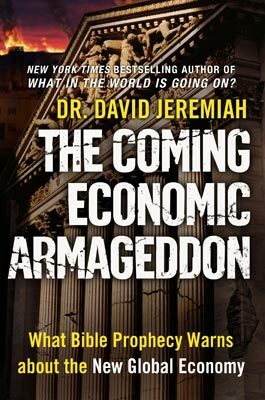 On October 5, 2010, TV preacher David Jeremiah’s published his thoughts in his new book, The Coming Economic Armageddon: What Bible Prophecy Warns about the New Global Economy. It is advertised: “New York Times bestselling author Dr. David Jeremiah uncovers the Bible’s prophetic clues to the world’s shocking financial future – prophecies that just might indicate that we are living in the final days of Earth’s history.” Note the escape clause, found in many such predictions: “that just might indicate.” If the current recession does not lead directly to the end of the world, he wants to maintain plausible deniability. [Addendum – the Great Recession of 2008 in fact did not lead to global meltdown nor a One-World Government]. My guess is that he’ll be getting a T-shirt, escape clause or no. “Bible experts” typically identify the antichrist with our current enemy in the world, so throughout history he’s been predicted to be catholic; or an atheist; or Muslim; or a Nazi, Fascist or Marxist (views which are now out of favor); others a Jew or an Anglican. I guess we were due for another round of “Muslim antichrist”. This is the same sort of methodology of which Jack van Impe is the master, that whatever newspaper headlings say, Richardson views it as a fulfillment of Bible prophecy. For example, when Mubarak was president of Egypt, that fulfilled Bible prophecy; when the Egyptians threw him out of power, that too fit into the Bible. Folks, if there’s a person who sees everything as a sign of the end, then to him or her NOTHING clearly signals the end. Read your Bibles, stay alert, live in the light, walk with the Lord. This from the 2016 version of his prophecy book, which you’ll need a calculator and a calendar to wade through. However, after having had a discussion with the author, I looked at his website and discovered that in the original, 2008, version of his book, he predicted that “the ‘Rapture’ would be on the “Feast of Trumpets” in September, 2011.” (When I pointed this out to him, btw, he tore into me as a liar and distorter of the Word.) In the 2015 edition, he predicted a Sept 15, 2015 rapture! And when the 2015 date fell through, he took a month or two to catch his breath, pull himself togethet, and sally forth again with a new prediction, “Ah, I meant to say September of 2017!! !” I guess he forgot to carry the 1. O! that all false prophets were so easy to disprove. Heeeeeere’s your T-shirt! Reading further into it, that 7 year treaty was never signed at all. Do you thin that’s the treaty in the scripture? Or do you think it will be something beyond that? I feel like at the state now, we are probably pretty far from signing any treaties with Israel let alone the Middle East. And another question. Do you believe we are in the last of says? Should I stop planning for my future and children and focus on the dark stuff? Back when I was 8 I started getting told that we were in the last of days.. Now I’m 29 and I want to have a family with my husband but not if I think I’ll only get a few years with my children..
As it was stated below by krista that treaty that went down wasn’t the one in the bible because not only will that join many nations, the antichrist will bring that one into play and he’s not need uncovered yet contrary to popular belief. I stated as well that I do not think we are quite there yet, and I don’t think it will go down all the way in my life time, but Gary also said he doesn’t believe because we aren’t meant to have that knowledge. God bless you and your husband! My husband and I too are going to try for kids in a year or two! Ive let god take my life and you should do the same Lauren! It’s pretty bad that I’m only 23 and I’ve seen so many end iof the worlds already. Literally it’s all these preachers want to do. I do not believe we are in the end times, and my reasons I deem valid. God does not run on our time, but his. 1 year for us could be thousands for him so who is to say te 7 years isn’t 70? Or 700? I think perhaps we could arrive there later In my lifetime but I’ve been told by pastors NOT to plan for children because they won’t live past about 5. I’ll live like jesus commanded. Without worry of the future. Thinking about the here and now. I don’t watch news or get dragged into this fear mongering. I love happy and will until my last day here. It says in the bible not even birds worry do their future so why should I? My grandmother said her generation was proclaimed to be the last. Her mother said the same, and my great grandmother too. I think every generation was told they were the last since Christ left us. God bless your blog, and you for being a sensible christian Instead of an end times mad man like half the preachers want to be, for money too! If it was such importance for them to get out why do they need your money to do it? Hi Missy, many blessings, and I hope you invite your friends! Your experience is appalling, it is worse than mine, and I have been dealing with this since the early 70s. You might enjoy clicking on eschatology in the topic cloud, to see some essays on the tribulation, Gog and Magog, etc. Blessings!! PS ah, also the article on paranoia at the top of the blog! It is appaling! The fact that you also have seen all this proved a point. As I said I’ve heard 80-90 year old people tell me their generation was meant to be the last and look where they are now. I will! But I’m not worried about any of it to be honest 🙂 I don’t fear it any longer. I did before when preachers were tellin me not to plan my future with my fiancé but now I’ve seen the truth behind it. As I said, I honestly can’t say I believe we are there yet. It’s just such a fad to talk about it lol! Do you know that, in the early 1970s they were telling me it was a waste of time to go to college, because the world would end so shortly. In the long run I went to college beginning in ’76, for a total of 10 years full-time and gained a PhD in the eschatology of Paul. For 27 years since then I have been equipped to do much more than if I hadn’t trained. The 10 years have already paid off well. I took an 11th year to study Spanish, and that 1 year has already paid off many-fold. And people are even now telling me that the Lord HAS TO return within a couple of years. Blessed is the one whom the Lord finds working when he returns. I’m being told to this day that The Lord WILL return soon, not to bother planing for my future. There are countless home made websites out there shouting the end is is here jesus is coming I hope you’re ready. But what bothers me is that hardly any of these people are even trying! The website raptureready.com has Been connecting world events to the bible and claiming that they are at point for years and years and they continue to do it without proper education in my eyes. As soon as someone hears something bad on the news their first shout is ‘end times sign right there! !’ When look just how far that’s gotten you! I’m not going to stop living for the now. As a blossoming christian, I’m enjoying my studies and I’ve brought a few friends to Christ in various ways. I’m working with my youth minister right now to set up a little gaming night to bring the you get kids who like to play video games in to learn about jesus while they are having fun! I mean what’s more fun then learning about the love and gospel of Jesus Christ and then having a 9 year old whip you in Mario kart? Haha! Dear Missy, thanks for the insight, and for giving me a couple of laughs. Blessings for your ministry during this age. Raptureready.com, yes, they are one of the worst offenders, principally because they make their fakey calculations of the time of the second coming look like some sort of algebra equation. It’s still nonsense, and against the plain teaching of the Bible. In recent years, George W Bush was the antichrist, now President Obama. Whoever is president in 2016 will be the new favorite candidate, I imagine. Completed. If so where’s the AC? He’s not been revealed. As good as it is to be prepared, I don’t think it’s good for these people to do this connecting every single year. Fact is, these signs have been obvious I believe since jesus left us. There has been violence, famine, disasters, hate and percecution for ages. It’s been worse at times also! Revelations is clear but unclear. No one knows the time so why make yourself look silly every year when you try and are wrong? When the Lord returns, may I be found doing what he set for me to do. My replies seem to be not going through, darn technology! She said only 20% of the world will ever see heaven and the rest will be in hell no matter what they try to do. Then she claims jesus pulled a screen down and showed her the rapture and end. What’s your take on her stories? She’s now claimed to have seen heaven and hell through jesus 3 times. Hi Missy, incredible, isn’t it! I hadn’t heard of this new one, but found her page and will read it over. Did you see where The Boy Who Came Back from Heaven, Alex Malarkey, recanted his story? Which had made millions of dollars? I’ve noticed that most false prophets are a very opportunistic bunch of cobras. I must admit, even I have fallen prey to their deceptions. It’s all about the end of days cash cow. They not only take advantage of the end times hype currently overtaking God’s church, but also of current situations. They state “Since currently x is happening, this must be a sign of God’s judgment, so y must be the inevitable outcome.” This causes fear mongering and fear is always a best seller in any situation. I have read conspiracy theory after conspiracy and prediction known to man. Like you, it really aggravates me that certain televangelists are taking advantage of the Church. This is why Biblical discernment is so important. Lack of Biblical discernment is a big reason people fall for all of this in the first place. I find that a smart way of not falling into such a pit is by looking at what they teach. Matthew 7:16 states, ” By their fruit you will recognize them. Do people pick grapes from thornbushes, or figs from thistles?” If their teachings are not consistent with scripture, you can’t count of them to have received the gift of prophetic discernment. By the way, thank you so much for your teachings. You really bring reason to such a chaotic time in the Church. Continue your work. Blessings Krista, I don’t remember if you have visited us before, so, welcome! Yes, money and power are still leading motivations today, in the prophetic circles and also in the Prosprity doctrine. Lately there is this Four Blood Moons notion, and the conspiracy theory that Obama will inject everyone with a microchip. And that he has thousands of guillotines ready for those who reject it. This will pass away and others will replace them. I think it’s because people lack understanding about the chronological order of Revelation and what Revelation is trying to say. Yes, I do believe Jesus is coming back son, but I also think God has too many plans to expand His Church. He did say the gospel would be preached to the entire world, but we have not reached the entire world yet. Yes, don’t get me started on Alex Jones. And I have heard far worse from the Christian Apocalyptic camp. Past a certain point and we’re talking about genuine paranoia. And part of our paranoia is that we attribute omnipotence and omniscience to our enemies. For example, the idea that Obama “made the Malaysian airplane disappear”, somehow, in order to kidnap 20 Chinese tech guys or to take the heat of him for one thing or another. Are you familiar with the key article, “The Paranoid Style in American Politics”? (http://harpers.org/archive/1964/11/the-paranoid-style-in-american-politics/) Well worth a read. I agree that the Lord predicted that the gospel would go to all nations before the end comes. It hasn’t yet happened, as you point out – “And this gospel of the kingdom will be preached in the whole world as a testimony to all nations, and then the end will come.” (Matt 24:14). I don’t believe the second coming is soon, I don’t believe it is far off; I don’t believe anything, since the Lord says that all such questions are God’s domain and not for us to know. He will come when he comes, and my job is to be ready. I should mention that I believe the rapture is a part of the Second Coming at the end of the tribulation, as spelled out in Matt 24-25. I used to be pre-trib, but changed my opinion some years ago. I know of no evidence that it is a separate event. Thank you Gary. You’re gift of Bibical discernment is a blessing. I’ll be sure to check out your other articles. let’s say that i have a feeling something will come to pass but i’m clear that it’s a prediction of mine and sometimes i’m right and sometimes i’m wrong. however if you claim that God revealed it to you and it doesn’t come to pass and you were telling everyone it was a revelation that’s a false prophet. how many times have i seen someone doing drugs or something harmful and said; if you keep going at that pace, you won’t be here in a year. many times all of us perhaps have said things based on experience. i think if you claim that God told you, then you become the prophet or false prophet. what do you think? I’m 53 years old and have lived through at least two dozen “end of the world” prophecies and Hagee has preached much doom and gloom nudge the years because it sells better than good news. Every time someone says the world is going to end on such and such day or time just let’s up know its not…its at an hour we think not . SO thanks Mr. Hagee for confirming the blood moons mean just the contrary of your “prophecy ” ..how to tell a true profit ? easy…what they prophesy comes to pass…something Mr. Hagee has always failed at! I called Mr. Camping and asked why he takes a literal view on the earthquake verse and allegorical on other verses. He did try to answer, but did not clear it up for me. God created mankind and I believe knows best how to communicate with us, that is by reading the Holy Bible as it is written, literal and with common sense. Every prophecy was written in a literal form and happened just as written. Using allegory allows Mr. Camping lots of “wiggle” room, therefore it is hard to hold him to an absolute. The only thing that is going to prove him wrong is May 22nd. I do think the “rapture” might be close, but no man knows…period. I pray he and his followers will come to the Truth of the Holy Bible and salvation. Great post Gary. Camping is the worst offender in this present time if you ask me. He’s even put billboards out on I-95! I think that the study of End-Time prophecy (and I study it quite a bit) can be very encouraging but set dates is going to far. It’s a clear violation of our Lord’s words in Matthew 24:36. “No one knows about that day or hour, not even the angels in heaven, nor the Son,£ but only the Father.” I love the T-Shirt idea!!! If you’d actually had read Joel Richardson’s book, he notes that his interpretation is not new, going back thru Church history to the early days of the church. While Islam certainly didn’t exist back then, some early theologians saw the antichrist as coming from the the region of the Eastern Roman Empire, former Assyria, etc. As time progressed, some Church leaders saw the empire and/or religion as Islam since it had taken control over those regions. Furthermore, Joel doesn’t just discuss the eschatological aspects. The latter part of his book pays specific attention to promoting the love of Christ, love towards the unsaved, love to Muslims and being willing to become a martyr for Christ, no matter why or because of whom. With all due respect, brother, I think if you had read my blog more closely you would have written your response differently. You say “he notes that his interpretation is not new,” presuming, I guess, that I wasn’t taking that into account already. I’m a student of church history and of prophecy, and know that the Muslim-antichrist interpretation has ancient roots and is perhaps the longest-lived interpretation. And, where did I say that Mr. Richardson was supposedly teaching a new thing? My point is that when the Muslims are in the news, people take the logical step of looking to them for the antichrist. I ok…In my opinion the Church should react to such prophecy and false prophets. I have an advice for you, Go ahead.